This Saturday night at Memorial Hall, the Kansas City Roller Warriors will take the track for the final time this season to decide who brings home the coveted Warder Cup at the 2017 Rink of Fire Championship! So let’s get down to brass tacks. This year’s championship bout is four months in the making and features the undefeated Dreadnought Dorothys taking on everyone’s favorite schoolyard bullies, the Black Eye Susans. The Dorothys come in with a flawless record (6-0) for the first time since 2011. They’ve taken down every other KCRW team twice this season, and they’ve done it in impressive fashion, outscoring their opponents 1234-939. That gives them a point differential of +295, which is hands down the best in the league. The rough and tumble Black Eye Susans, tough as they always are, come into the Rink of Fire boasting only a 3-3 record. Although they’ve outscored their opponents this season 1130-1074, giving them a point differential of +56, their meetings against the Dorothys both resulted in losses for the BES. The Ruby Reds have outscored the Black & Yellow in head-to-head action this season by a combined total of 411-348, for an average of 31.5 points per game. That’s actually not a lot. 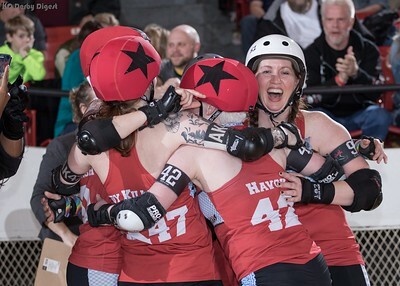 In WFTDA competition, a 32-point win (or loss) is hardly a blowout, and consider also that the first meeting of the season between these two teams in Game 1 was a knock-down drag-out that saw the Dorothys win, but also gave us some of the best back-and-forth action we saw all season long. Anyone predicting a snoozer Saturday night is going to be proven terribly wrong. Having said that, we’re predicting a Dreadnought Dorothys win by no more than 28 points. Expect that, but also expect these Susans to bring every. thing. they’ve. got. in this final bout of the season. Imagine what an upset victory it would be for a 3-3 team to take down a 6-0 team and claim the Warder Cup in the Rink of Fire. To my knowledge, it’s never been done. Saturday night, we’re going to see exactly what both of these teams are made of, and it’s going to be fun. Doors open at Memorial Hall in KCK at 5:00 Saturday night. Adult tickets at the door are only $15. Kids ages 6-12 are $9 each, and wee ones 5 and under are admitted free, as always. The first bout of the evening features the Knockouts (2-4) squaring off against the Victory Vixens (1-5). The first whistle is promptly at 6:00, and the championship bout between the Dorothys and Susans will follow immediately after. Join us at Memorial Hall this Saturday night for the 2017 Rink of Fire championship! We hope to see you all there!